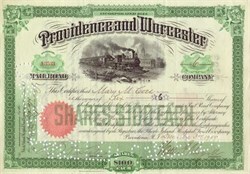 Beautifully engraved Certificate from the famous Providence and Worcester Railroad issued from 1900 - 1909. This historic document was printed by the Homer Lee Banknote Company and has an ornate border around it with a vignette of an old train. This item is hand signed by the Company's President, Walter F. Angell and its Treasurer, William A. Leete. This item is over 90 years old.